System Maintenance for our online services is currently scheduled for Sunday 07 Apr from 2000 hours to 0000 hours. Online services, Terminal system & Truck KIOSKs as well as City Depot & Midland Port systems will be unavailable during this short outage. Please accept our apologies for any inconvenience this may cause. Today Lyttelton Port of Christchurch (LPC) commenced its baseline water quality monitoring program for its proposed Channel Deepening Project. 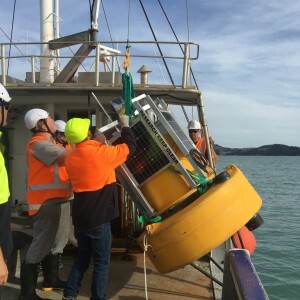 This is the start of the largest environmental monitoring programme ever undertaken for a dredging project in New Zealand. LPC is proposing to dredge the shipping channel in Lyttelton Harbour/Te Whakaraupō to deepen it in preparation for the visits of larger container ships. Before any dredging can commence LPC must gain resource consent under the Resource Management Act to carry out the dredging and disposal. LPC plans to lodge its application later this month (September) and will request the consent is publicly notified. The Company will install 14 real-time water monitoring buoys throughout Lyttelton Harbour, Port Levy and offshore marine areas to ensure it has continuous live information on water quality. These instruments will collect information over a baseline period, including at least one year prior to dredging, during the proposed dredging, and for a period after completion of dredging. LPC Chief Executive Peter Davie says, “While the Company is committed to future-proofing the Port to secure Lyttelton’s future as the South Island’s major international trade gateway, we will not do this at the expense of our environmental responsibilities. “The water quality monitoring project is one of many investigations we are undertaking to ensure the proposed dredging does not result in any adverse outcomes for the environment,” says Davie. The 14 water monitoring sites will provide an in-depth understanding of the existing background conditions. Information from the sites will enable the proposed dredging operations to be constantly managed and adapted to ensure environmental effects are minimised and fall within anticipated levels. LPC will invest more than $3 million on its environmental monitoring program, including the installation of the monitoring buoys. Leading marine, estuarine and freshwater consulting company Vision Environment, based in Australia, has been contracted by LPC to implement and manage the water monitoring system. Vision Environment’s Director Dr Leonie Andersen, who is overseeing the installation process, says the methods and technology used in the LPC water monitoring project match those of large international dredging operations. “We consider this monitoring to be world’s-best practice,” says Dr Andersen. Parameters such as water turbidity (water clarity), pH, temperature and nutrient levels will be constantly measured during the baseline period. A summary of the data will be sent to a dedicated website every 15 minutes. The website is publically accessible 24 hours a day. It is expected that installation of the 14 buoys will continue for the next seven days. Dr Andersen says it is important that people do not approach the buoys. Monitoring equipment is being installed on the sea floor near each of the sites, and therefore people are also advised to refrain from anchoring nearby or off the buoys. Peter Davie says that LPC has been working with a range of international experts in areas including marine ecology, the study of sea birds, marine mammals, sediment, waves as well as tidal modelling to carefully evaluate and mitigate potential effects of the proposed dredging programme. “LPC is committed to protecting the health and mahinga kai values of whakaraupō and koukourārata throughout the project,” says Davie. With 99 percent of New Zealand’s freight carried by sea, and a 50 percent forecast in trade growth through Lyttelton, the proposed dredging project is important for the future viability of the Port and to continue attracting major international shipping lines. Dredging of the channel is not new and has occurred regularly since the first dredge came to Lyttelton Port in 1880. For more contact details click here.